SHEFFIELD, SOUTH YORKSHIRE – Wilson Benesch the leader in high-performance loudspeaker design and manufacture, is pleased to announce Eminence, the new Wilson Benesch flagship loudspeaker. As Wilson Benesch approach our 30th Anniversary year, we are now recognised for the considerable intellectual property developed through three-decades and successive research and development programmes. This R&D has often been funded publicly through grant funding awarded on the merit of the engineering excellence that exists within the company. Publicly documented, these ambitious R&D projects and the body of work they have produced recently secured Wilson Benesch an invitation to form an alliance as part of a multi-million-pound pan-European R&D project to develop tomorrow’s cutting-edge composites for applications beyond 2020 in aerospace and other advanced engineering applications. The alliance of Wilson Benesch with 13 top-tier Universities, a handful of similar SME’s as well as blue-chip companies such as Akzo Nobel underlines Wilson Benesch’s position at the forefront of advanced materials science . Eminence is born directly of the IP developed from this huge body of work, it is wound directly into the DNA of the loudspeaker. 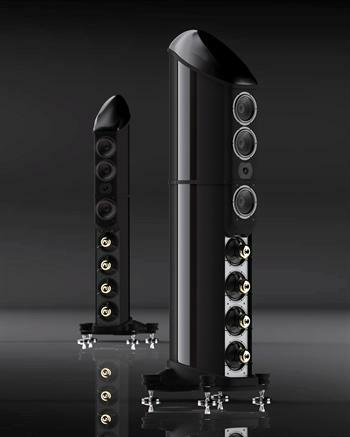 In 2012, Wilson Benesch introduced the Semisphere, the world’s first hybrid tweeter dome design based on Carbon fibre. The design highlighted our understanding of composite materials technology, specifically the need for damping as well as high specific stiffness in audio structures. The latest iteration of Wilson Benesch tweeter technology builds upon the revolutionary Semisphere tweeter design pushing it into the next generation. The exquisite Fibonacci tweeter faceplate is formed from a carbon fibre composite structure, creating a geometrically optimised waveguide, tailored exactly to the unique output of the Silk-Carbon Hybrid tweeter. This faceplate and the motor is in turn decoupled from the rest of the tweeter chassis, achieving not only ruler flat frequency response and ultrawide dispersion characteristics but also optimal frequency and timing integration with the Tactic 3.0 midrange drive unit. The proprietary Neodymium magnet – open architecture precision machined componentry ensures optimal energy paths for both acoustic and thermal energy; critical design considerations where super low distortion levels are aspired to. A new generation of drive unit that adheres to a steadfast design philosophy, the Tactic 3.0 drive unit retains the isotactic polypropylene cone which offers the optimal balance of stiffness and damping. This unique blend of material properties allows Wilson Benesch to maintain the crossover free, directly amplifier coupled design for the midrange drive unit that has been seen in our reference loudspeaker designs to date. The direct link maintains zero-phase distortion. It is the harmonious relationship between these two elements that opens the heart of the music, providing the listener with a realistic, immediate, highly articulate, yet natural character of the sound. Inspired by solutions found in nature and interpreted by Fibonacci’s formula, the new Fibonacci element results in a drive unit that produces text-book perfect roll off without any inductor, extended frequency response up to 4KHz and a flat frequency response within its operating range. The Eminence loudspeaker enclosure is the most advanced Wilson Benesch enclosure ever built, taking the industry standard in terms of specific stiffness and damping into the next generation. A proprietary new core material developed directly from the current R&D projects in progress using FEA, increases the stiffness to damping ratio of the A.C.T. 3ZERO Monocoque by 30%. An internal matrix of high-tensile 14mm steel ties actively compress all the vertical structures reducing any resonant artifacts. High-gloss 2 x 2 twill weave carbon fibre pays homage to the original Carbon-Nomex structure that Wilson Benesch introduced to the High-End audio industry in 1989 whilst enhancing the aesthetic of the 20-degree slope in the complex geometric carbon fibre top. Eminence stands boldly apart from the flat panel, wooden box and metal alloy enclosures that are ubiquitous to loudspeaker today. The precision CNC machined aluminium components and high gloss A.C.T. 3ZERO Monocoque, gives Eminence a luxurious automotive fit, finish and aesthetic. Eminence is a statement in State-of-the-Art contemporary loudspeaker design and engineering. No other component bears testament to this than the Eminence foot. The largest sub-component of this complex structure requires a quarter of a million lines of CNC code and 16-hours of machining, reducing a 100kg solid billet of aluminium by more than half, to create a single 38kg Eminence loudspeaker foot. This formidable component governs over the energy above by way of the 14mm tie bolts that generate a metric ton of compressive pressure. This is the foundation, ground zero and arbiter of performance.